The short film was originally planned to be in Stereo. However, many things stopped us from it. But now, the film is being reworked to be what it was meant to be. More about that on The DO-Cave team blog (our studio blog). 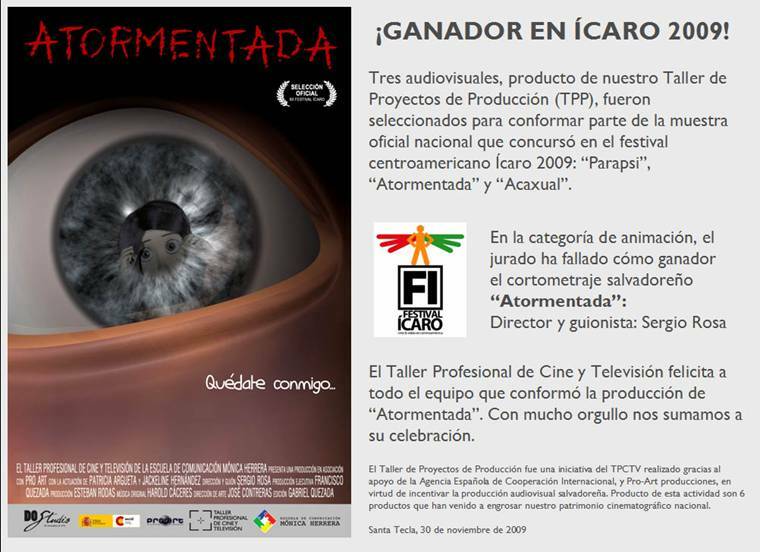 And the winner is… "Atormentada"
•December 1, 2009 • Comments Off on And the winner is… "Atormentada"
The Ícaro film and video Festival, in its 12° edition was held in Guatemala, and its the most important and most prestigious festival in Central America. El Salvador submitted 59 works into different categories, and only two managed to win the great prize. One of them is our short film “Atormentada” (“Tormented”), selected by the jury as the Best Animation in the contest. Unfortunately none of team members was able to travel to Guatemala. However, the statue was received by the Ambassador of El Salvador: Silvio Mora Mora, who was there representing the director. In the animation category there were 4 short films from Costa Rica, 3 from El Salvador, 2 from Guatemala, and 1 from Nicaragua. The jury nominated 3 finalists: 2 shorts from Costa Rica and ours, selecting “Atormentada” as the winner. We’reextremely proud of our work and also happy for this victory. The project was made possible thanks to the Spanish Agency of International Cooperation, Escuela de Comunicaciones Mónica Herrera, Pro-Art and all the members of the production team. For more info about the Icaro Film Festival click here. The winners list can be found here (we need to clarify that Giovanni Fabietti is not the director of "Atormentada"; that’s been a mistake made by the organizers of the Festival, who have been notified but who haven’t fixed the issue yet; the name of the director is Sergio Rosa, as can be seen on the image above). This Saturday Cinepolis El Salvador held a private screening organized by Festival Icaro 2009, a film festival that takes place in Guatemala this November. The films screened in that event are the ones selected to represent El Salvador in the Festival in November. The good news is that our film “Tormented” was selected as one of the 4 animated films that will be screened during the festival. Festival Icaro El Salvador 2009 was held in Cinepolis. The best productions made in El Salvador were carefuly selected by the international jury conformed by Ana Xóchitl Alarcón, produced and educator; Juan Grillo, movie critic, and Guillermo Escalón, filmmaker and director of photography. The films that will compete against those from the rest of Central America and the rest of the world in the Festival Icaro XII are varied. In the documentary category you can find "No te aguebes," by Benjamín Romero; "Acaxual," by Julio López and David Gallardo; "La Ciudad, la traición y la fe," by José Angel Mejía; "Flor de piedra Lily," by Marvin Aguilar and "Contaminería," by Juan Abrego. In the long documentaries category, the films selected are "Llevarte al mar," by Jorge Dalton, and "colima," by Oscar Orellana. The featured projects in the short films category are "Bebé a primera vista," by Francisco Cáceres and "Parapsi," by Miguel Villafuerte. Even if the feature films category received no entries, the animation category includes films like "Historia de un dolar," by Erick Alexander Renderos; "Cuidado al volar piscuchas," by Silvia Callejas; "Tough time for a tortoise," by Héctor Palacios, and "Atormentada" by Sergio Rosa. In the "experiments" category you can find "Imágenes contemplativas I y II," by Alexia Miranda; "T.A.C. Trastorno Amoroso Compulsivo" and "Inclusión juvenil en el país de la salvación," by Sarbelio Henriquez. Finally, in the news reportage category the selected projects are "Edwin, niñez sin rostro," by José Angel Mejía and "Angie y Kelly; mucho amor, poca comida," by Ernesto Villalobos. Now the second thing I’d like to talk to you about. We finished this movie four months ago, and since then many have been wondering when they will be able to see the movie. Well, I just got an email anouncing that the opening night will be on October 22 2009 in Cinemark La Gran Vía. This will be a closed event, obviously, reserved for the filmmakers, actors and crews of the different films. However, the movie will be available to the public the next day, October 23, so if you live in El Salvador (or happen to be in the country during that date) make sure to go to Cinemark La Gran Vía and grab a ticket. That’s the title of a note recently published on the local digital newspaper “El Faro.” The whole thing is a video interview held by Diego Murcia. You can watch the video here (spanish only). A lot of people are wondering when the film is going to hit the theaters. Unfortunately we don’t have that information yet since we’re waiting for the movie theater to provide the definitive date. We hope it will be soon, as we really want people to see what we’ve done. Just because the film is finished doesn’t mean we don’t have anything else to share! Last week a local newspaper made a coverage on our short film. At first I thought this would be one of the “small side news that get posted somewhere,” but it turned out to be a full-page coverage (and also the main page on the “entertainment news”). The producers of the short film expect the film to be accepted in the festival "Animadrid" in Spain, as well as the "Icaro film festival" in Guatemala. 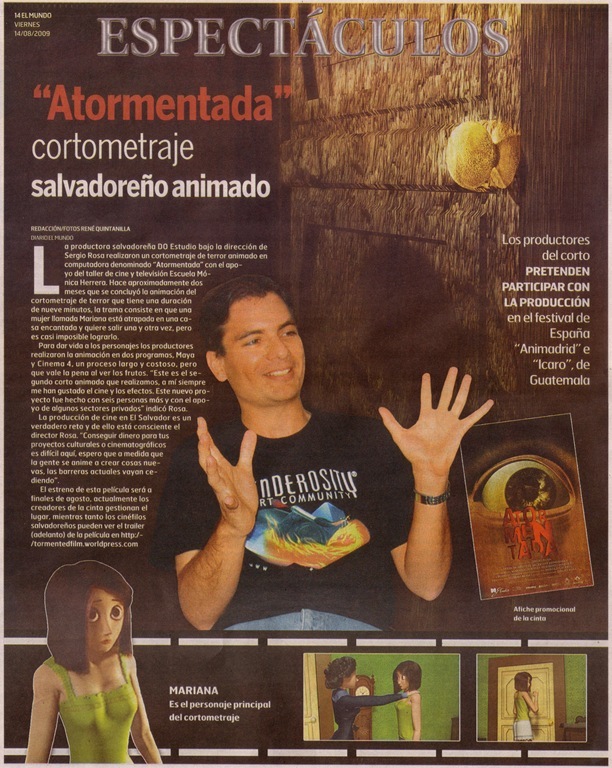 The production house DO Studio, under the direction of Sergio Rosa have made an CG animated horror short film titled "Atormentada," with the participation of the Film and TV workshop from the school Monica Herrera. Around 2 months ago they finished the horror film that runs for 9 minutes. It’s about a woman named Mariana, who is trapped inside a haunted house, and who tries to get out over and over against all odds. In order to bring the characters to life, they used 2 different software packages, Maya and Cinema4D. The work is time consuming but it’s worth it once you get to see the result. "This is the second animated short film we’ve made. I’ve always been keen on movies and visual effects. The project was made with 6 other people and with the support of a few private entities" said the director. Producing films in El Salvador is a real challenge, and the director is very aware of that. "Getting the funding for the cinematographic projects is very difficult here, but I hope things will change as more people create more and more films." We’re two weeks (or so) away from the opening night, so we decided to raise the expectations by creating a new webatrical trailer. Unlike the previous (teaser) trailer, this one shows you a little more about the film, the story and everything else. So far, people have liked what we’ve done here, and hopefully they will also like the complete film. Remember, if you live in El Salvador, this short film (and a handful more) will open in nearly two weeks.